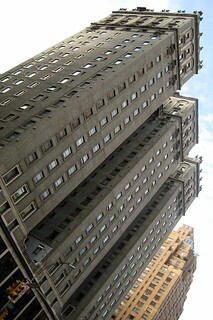 The Vanderbilt Hotel, a historicist skyscraper at 4 Park Avenue, was designed by Warren & Wetmore in 1913. Built by Gwaynne Vanderbilt, the great-grandson of Commodre Cornelius Vanderbilt, primarily for permanent residents, it is a showcase for terracotta and one of the city's most fashionable addresses. The Vanderbilt heirs sold the building in 1925. In 1967, the hotel was converted to apartments on the upper floors, with offices on the lower six. .
Underneath the building is Wolfgang's Steakhouse, run by the Wolfgang Zwiener, who was the legendary headwaiter at Peter Luger's for 40 years. The space, recently called Vanderbilt Station, was famous as the Della Robbia Bar, aka The Crypt. The vaulted Gaustavino ceiling is the big claim to fame. The rumor that this used to be Commodore Vanderbilt's secret private subway station seems not to be true.